Toronto's Corus Quay Building Boasts a 5-Story Living Wall and Indoor Slide! Toronto’s Corus Quay Building Boasts a 5-Story Living Wall and Indoor Slide! Corus Entertainment, one of the biggest and most powerful media companies in Canada, has a new home in downtown Toronto - and it's one of the most sustainable new buildings in the city. The Corus Quay building features several cutting-edge sustainable building strategies (including a green roof and a gray water recycling system), but the most striking aspect is easily the five-story, dual-sided living green wall that adds some aesthetically pleasing foliage to the new office building while acting as a biofilter, purifying the air. Oh, and did we mention there's a three-story slide cutting through the middle of the headquarters too? There are plenty of reasons we’d love to work at the Corus Quay building — especially the three-story indoor slide! The convenient mode of green transportation whisks workers from a third-story lounge area down to ground level. (Sadly, though, the slide was closed when we visited the building this week.) The striking, colorful interiors were designed by Toronto firm Quadrangle Architects, which was granted two ARIDO awards of excellence for its work on the building. 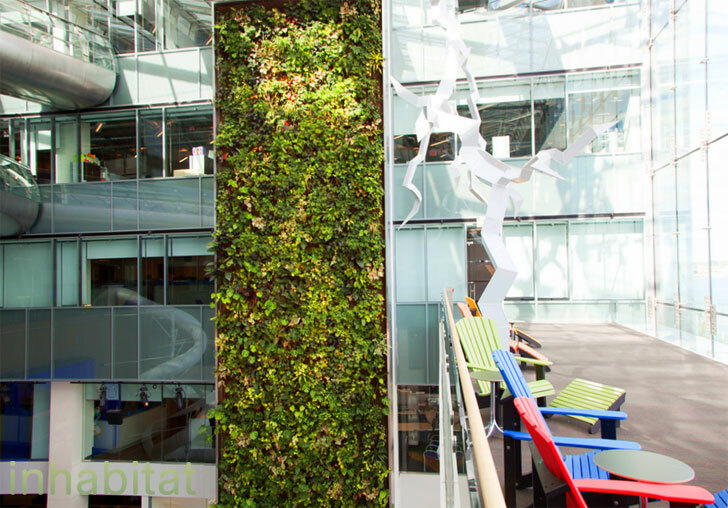 The vegetated wall, which was designed by Nedlaw Living Walls, is located in a large, five-story atrium, which floods offices throughout the building with natural lighting. The wall and the atrium area also provide an inviting place for workers to take a break, with reclining Adirondack chairs that look out on dramatic views of Lake Ontario. The building, which was completed in 2010, was one of the first buildings to be built on Toronto’s massive new waterfront development, and it serves more than 1,000 employees. To add to the already-inviting work environment, the building features three public art installations by UK artists Troika, and the wood paneling in the atrium area was made using reclaimed hemlock from a 1910 ferry terminal wharf in Toronto. The boxy, 500,000-square-foot building was designed by Toronto-based Diamond Schmitt Architects, and it’s expected to earn LEED Gold certification. The building, which was completed in 2010, was one of the first buildings to be completed on Toronto's massive new waterfront development, and it serves more than 1,000 employees. The boxy, 500,000-square-foot building was designed by Designed by Toronto-based design firm Diamond Schmitt Architects, and it's expected to earn LEED Gold certification. There are plenty of reasons we'd love to work at the Corus Quay building, and here's another big one: right next to that massive green wall there is a three-story indoor slide, which twists and turns, whisking workers from a third-story lounge area down to ground level. 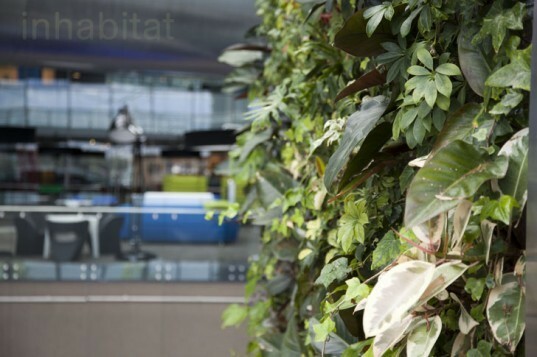 The vegetated wall, which was designed by Nedlaw Living Walls, is located in a large, five-story atrium, which floods offices throughout the building with natural lighting. The wall and the atrium area also provide an inviting place for workers to take a break, with reclining Adirondack chairs that look out on dramatic views of Lake Ontario. To add to the already-inviting work environment, the building features three public art installations by UK artists Troika and wood paneling in the atrium area that was made using reclaimed hemlock from a 1910 ferry terminal wharf in Toronto.